I like coffee. I like diet soda. But what I really like is tea. I know it's not the real thing but I navigate fast food places on the fact that they have unsweetened iced tea on tap, unlimited. On a hot day I can find a Fatburger or something that has AC and chill my insides down the level I prefer, which is about three hours after death. On the other hand, I also really like having Tea. You know, tea with all the extras; sandwiches, little cakes and various things that are served with jam and clotted cream. It's sometimes called "High Tea", like "it's high time we ate something", especially if you're going be eating dinner at 9. There's a place in West Hollywood that does this a treat. 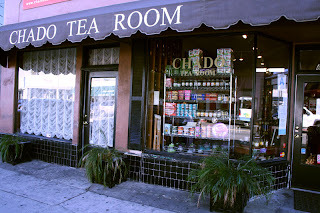 It's called Chado Tea Room, and it's across the the street (sort of) from Le Labo. As a matter of fact, at the only Sniffa LA I attended, this was the very-much-needed pit-stop for a bracing cuppa and a bite or three between visiting all the sniff-centric spots in the neighborhood. You can choose from literally hundreds of blends to taste, all of which you can take home. The High Tea is delicious. So I do love a fresh brewed pot of the real thing. Don't hate me that I like the diet coke version at fast food outlets. I'm keeping my New England core cool in the desert. If any one of them would come up with cold jasmine tea on tap I'd praise them to the skies. If you have your own tea rituals, cold or hot, please share them in the comments. As a southerner, unsweetened tea is an anathema. Southerners know to ask about "real" (brewed) tea. I don't mind getting iced tea from fast food places as long as it is brewed. As for hot tea, I drank that by the gallon when I lived in England. I like sugar in my hot tea, but no milk or cream. I go to this tea room called The Front Porch about 30 minutes away from me, and it is quaint. A little too kitschy-American-Victorian, but the tea and food are great! They even have a whole wall if vintage hats you can pick through and wear while having tea, and mismatched fancy china and silver. They have the most amazing pumpkin soup with buttered bourbon croutons that they serve close to the holidays when you stop in for tea. And I just found out it's being sold as the owner wants to retire. I love unsweetened iced tea as and all kinds of hot tea. Dunkin Donuts does a decent iced tea and the price is right. It just kills me that upscale coffee/tea places charge about three dollars for a large cup filled with ice and a dash of actual tea. I don't mind that people want sweetened,; I'm all for keeping a jug of simple syrup for them. But I don't like sweetened tea. Sadly I don't think it's brewed at most places. They put up those faux brewers but they're really tea concentrate and water. like the Coke machine. But I don't like sugar, so I'm okay with it. Chado was threatened with closure, thank goodness it didn't happen. I miss Dunkin Donuts. Their coffee is really good. Another tea lover! And i betray my northern origins here in the south by always asking for unsweetened tea with lemon. Jasmine tea, or Lady Earl Grey make a nice mid-morning break for me, and I'm always glad to have a cup, expecially when it gets chilly. Ginger tea for after dinner...Yes, this post does seem to have hit the spot for me today! we'd get along just fine! i drink hot tea all day long, no matter how hot is it outdoors. it cools me or heats me up, as needed. iced tea can make me too caffeinated and jittery. hot tea doesn't. just started a new "ritual" with coconut milk (unsweetened) in my black teas. it's rich and satisfying and just perfect for tea. don't cream my green teas - it just doesn't seem right. and i always use honey to sweeten, no matter which tea i'm drinking. mcdonald's sweetened iced tea is pretty good! when i go to restaurants, and have a craving for iced tea, i usually do a mix of mostly sweet tea with a dash of unsweetened to cut it. don't have the patience to let my sugar dissolve - that's why i go with their pre-sweetened brews. and i don't use the powdered fake sweeteners, which would dissolve. i like fruit-flavored teas unsweetened, though - they're already pretty sweet - and i find them more refreshing unsweetened. Serious tea-drinkers (and others) will enjoy Samovar, in San Francisco near MOMA. I give it my highest praise for truly fine tea, service, good food, ambience, comfort, etc. Unsweetened tea drinking Southerner here; I have managed to absorb one or two California traits in my twenty years here, and unsweetened iced tea with lots of fresh lemon is one of them. I drink it to the point of severe jitters and tannin induced stomach ache. I prefer sun tea, but will make it myself with not-quite-boiling water during June Gloom season. When I lived in LA County, I found tea at the Pasadena Ritz to be lovely, and believe it or not, the Arboretum used to have a decent tea! This was eons ago, mind you, but they had an actual Englishwoman inthe kitchen,and the nibblies, especially, were delightful. I think Cracker Barrel has the best iced tea of all low end restaurants, McCormick and Schmick's of middle range. Seafood places in general seem to have the best iced tea, Mexican restaurants the worst, IMHO. No, no, no. High Tea is supper; not the little sandwiches and fancy cakes you describe. That is called Afternoon Tea. Another name for High Tea is Meat Tea, because you serve a proper plate along with the tea. This is served at about 6:00 p.m. An Afternoon Tea goes from about 4:00 to 5:00 p.m. traditionally. But sometimes they will be served from about 2:00 to 5:00 nowadays. There is no meat or fish with Afternoon Teas. They just hold you over until dinner time.